Looking for the best WordPress host in the UK? You’ve come to the right place. Why might this article be interesting for you? You spend too much time on backups, maintenance, installing WordPress locally, etc. Why might this article not be interesting for you? With regard to the free automatic migration, you can find more information and the video later in this article. So that is fantastic news if you e.g. only have one website that you would like to transfer, but you are hesitant and/or not technical. The only condition for the free migration is that you pay annually (instead of monthly). But since you still have the 30-day money-back guarantee, you can simply use that free migration. And if Kinsta doesn’t live up to your expectations, you will still get the full amount refunded. How did we end up at Kinsta? This is actually a long story. I will try to keep it short… Since 1998 I have been, one way or another, busy making websites and being found on Google. In addition, I have always had an obsession with speed when it comes to web pages. Obviously, of course, I always wanted the fastest websites myself! In 2015, I started with the website Sneakerwijzer.nl (in the UK Sneakerscanner.co.uk). Before that, I had already managed and created dozens of sites, both for myself and for clients. And we are still doing that today. Sneakerwijzer.nl is a price comparison website for sneakers. For this site it’s of course essential that it’s always online. But also that it’s fast, since time is money here. And you have to realise that SneakerWijzer gets 32,000 visitors per month, contains more than 13,000 sneakers and has hundreds of pages. In addition, dozens of visitors can search and filter at any time of the day and we have twenty-plus web shops that need to be updated several times every day. So, both at the front (the visitors) as well as at the back (the database with the web shops) the hosting must be extremely fast, stable and powerful. That is why I spent years looking for the fastest and best WordPress Hosting available. Now I have to look no further! In the course of time I have been doing business with the following WordPress Hosting companies: Byte, My Domain, Duco Hosting, Domeinwinkel, Yourhosting, Neostrada, HostGator, GoDaddy, Strato WordPress WooCommerce Hosting and a number of other lesser-known web hosts. And beware: it’s certainly not the case that I was dissatisfied with all these providers. With these hosts I have tried almost everything: SSD Hosting, Virtual Private Cloud, Managed Hosting, WooCommerce Hosting etc. And as said: it’s certainly not that I was always dissatisfied. 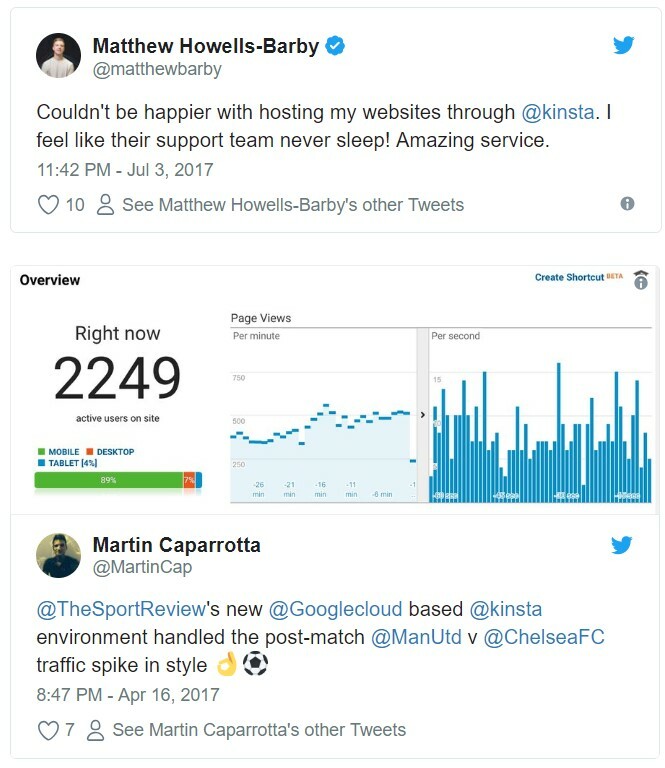 But the speed, quality, the possibilities and the sublime support of Kinsta: it’s really a whole different league and a huge relief. Let’s say they are in the Champions League of WordPress Web Hosts and have been champions for years now. At SneakerWijzer we can now finally fully focus on what we want and enjoy: continuously develop the website and have time for marketing. When we were trying to get the latest caching plugin to work properly for the eleventh time, I went for the umpteenth time on Google to search for the fastest, most stable and best WordPress Hosting UK to be found. Eventually I ended up with a benchmark test, see here the 2018 version. In that benchmark I read the great results of Kinsta and I decided to make the switch, primarily because of the caching and the speed. Remarkably, some companies didn’t even struggle. 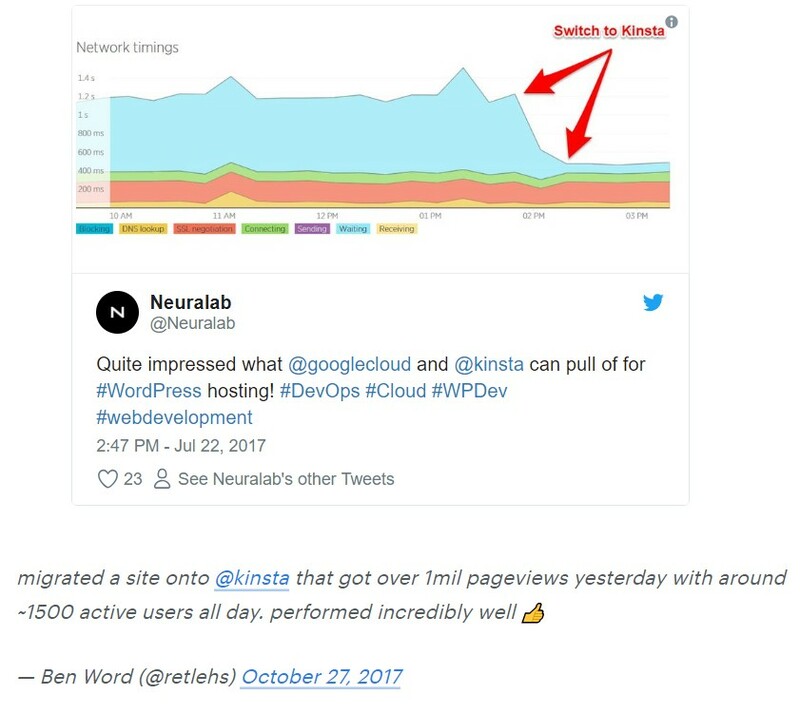 Kinsta kept sub one second response times for 30 minutes and nearly a quarter million requests. Most companies had a spike or two causing a higher peak response time, but Kinsta and Pantheon didn’t (and Media Temple had a tiny one at 1.5 seconds). They have recently introduced much cheaper “entry” plans, starting at just $ 30 a month! That’s great news for the single-site companies, bloggers and vloggers. Admittedly: that seems expensive compared to cheaper “shared hosts” but in terms of functionality, speed and time savings, I would always choose Kinsta again. You should too – at least if you take your website seriously and it’s important to you. It’s a no-brainer, once you have experienced their WordPress hosting. Check here for the entire overview, including all the features. For us at least those were the most important criteria we considered before moving to Kinsta. Plus of course, we do not mention the standard features you get from all serious WordPress Hosting companies. Check this link for a complete overview of the features. As mentioned, Kinsta uses a 30-day money-back guarantee. So, you can try out the speed and the other advantages for free. And now, with the Free White Glove Migration(s), you can effortlessly and risk-free test your site on the best WordPress web hosting in the UK. Naturally, Kinsta offers all the basic options that every good WordPress Host has to offer. Since those who are still reading this article are already working professionally with WordPress, I will limit myself here to the unique features of Kinsta. For each feature, I will show a video in this article so that you can immediately see how these features work in practice. 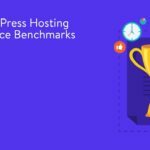 You can experience for yourself how easy and fast this best WordPress Hosting UK 2018-2019 is. For the real techies: check here or here all the advantages and the technical configurations. Of course, the fact that Kinsta is on the Google Cloud Platform is already a guarantee for speed. But there is a lot more. So, if you would like to improve your WordPress speed, read on! 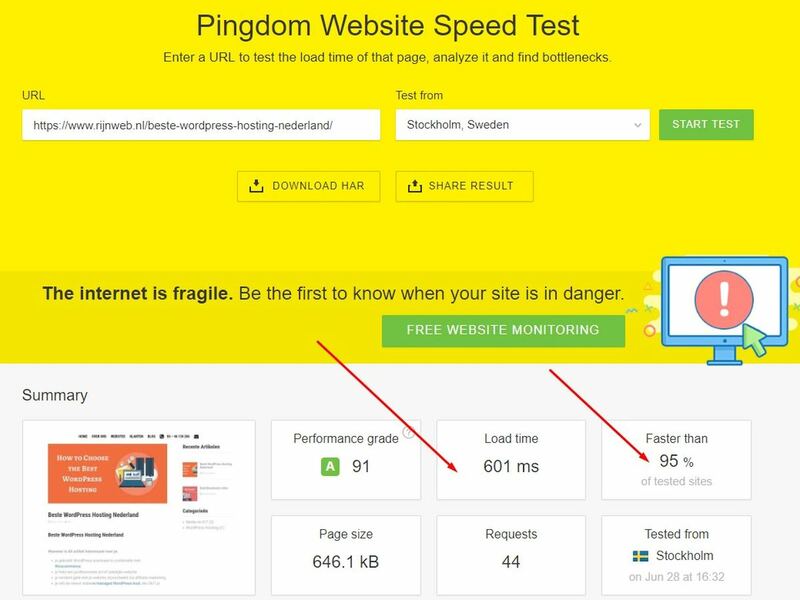 See below the results of this page tested via Pingdom: a loading time of only 601 ms, or slightly more than half a second, faster than 95% on the internet. In the examples below, we use standard Kinsta caching and configuration in combination with Cloudflare as free CDN (Content Delivery Network). 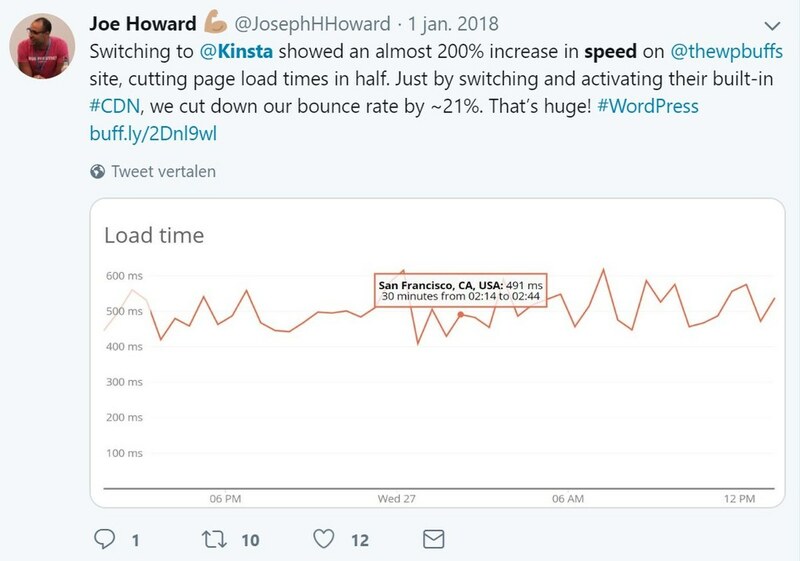 But even without Cloudflare, Kinsta is already much faster than all other (Managed) WordPress Hosting firms I’ve ever seen. One of the absolute top features of Kinsta is the one-click staging option: in other words, setting up a WordPress test environment with just one click. Now you can – without technical knowledge – set up a WordPress DTAP (development, testing, acceptance and production) street very easily and quickly. In our case one development environment, one test / acceptance environment and one production environment. The development environment is a WordPress website that is hosted somewhere else, where we set up the first versions of new ideas. The test and acceptance server in this case is the Kinsta WordPress test environment and the production environment is the live Kinsta website. This way you have a professional test street that you can set up and manage with one click. Very nice, easy and professional. No more mistakes, crashes, wrong content or other surprises on your live site! Now, you probably hear quite often that something is easy and just one click, but in this case that is actually really true. Check out my video below, so you can see for yourself how the staging option works or check out the Knowledge Base article on the Kinsta website. Previously, we had to install WordPress locally (with WAMP) to create a WordPress test environment. It would take at least an hour or so to have it up-and-running properly. The transfer to live also takes a lot of time and effort. In short: fortunately, installing WordPress locally is also a thing of the past. What Kinsta has done is simple but effective: a button to set up a test site and a button to put this environment live, if you feel the site is well tested and ready. And when pushing to live, the system also automatically creates a back-up version of the live site, so that, whatever happens, you can always go back to the previous version. Really brilliant. For me this is, besides the superior speed, the killer feature of Kinsta. It saves so much time, effort and frustration – incredible. And if you consider that a Business 1 Plan only costs $100 per month, that is actually really extremely cheap. After all, what does an hour of work as a self-employed person or as a company cost? And how many hours per month do you spend on setting up test servers, making backups, pushing test versions to live, monitoring your website etc? Or repairing errors on your website because you have done everything on the live site, because it takes so much time to set up a test environment? What is often the most cumbersome aspect with most web hosts, is making and restoring backups. Not so at Kinsta; easy does it! Literally with one click, you make a backup in less than 10 seconds. Check out this article for all of the information and see how this works in practice in the video below. Much faster; a site of 6GB is copied in about 10 seconds and you can continue working in the meantime. Restoring is much easier, and you can also restore a backup to your WordPress staging environment first. The backups do not count in your disk space. You get 14 daily backups and you can make up to 5 manual backups. In short, you actually get 20 times the amount of disk space from Kinsta for the same money. With every plan (see all of the plans here), you get one or more so-called Free White Glove Migrations. In other words: Kinsta does the whole migration of your website for you; you do not have to do anything. Well, almost. You have to give them the right information so that they can access everything from your current host. And it does not matter how big or complex your website is: they take care of it! This is also a very nice option that we have noticed when migrating SneakerWijzer. There are a lot of special things in it, so it was very nice that Kinsta arranged this for us within a few hours. Check this article for all of the ins and outs. Another significant criterion for the best WordPress hosting in the UK is, of course, support when something goes wrong. You can contact the support desk for general WordPress hosting questions, optimisation questions, or specific technical questions (e.g. specific caching rules) as well. It’s a good thing that at Kinsta, only real WordPress experts are manning the support desk. And not the kind of people that need to know all sorts of CMS systems, and know something about WordPress, but just not what you need. At Kinsta, they use a perfectly functioning ticketing system, via the Kinsta dashboard, where you can always retrace your questions. Furthermore, you will also receive an e-mail copy of the conversation for reference. There is no telephone support, but I have not missed that at all. There is a good reason for this, and in practice it works much better indeed. Except that the support is available 24 hours a day throughout the year, Kinsta technicians also monitor your website every five minutes. So, if something goes wrong with your site, they will immediately take action to solve it. Check the articles here and here to see exactly how this works. I myself experienced a lot of hassle with my WordPress htaccess setup. It’s wonderful that Kinsta does not uses WordPress htaccess and that you can easily arrange everything from the control panel. And if you want to, things can also always be arranged via the brilliant support desk. See also this article about WordPress htaccess at Kinsta. Here you can read all about why they do not need a htaccess file at all! If you make money with the Internet, it’s of course crucial that your WordPress Host is the best you can get. Especially if you have multiple websites. I know for sure that as a blogger / vlogger / affiliate marketer, you will be thrilled with Kinsta powered by Google WordPress Hosting. If you are looking for the best WordPress WooCommerce Hosting in the UK, you cannot find better than Kinsta. If you’re asking yourself: Yes, interesting, this stuff about Managed WordPress Hosting… but what is Managed WordPress Hosting actually? Managed WordPress Hosting is a full-service solution, where all of the technical aspects for running a WordPress website are managed by the host. The idea behind Managed WordPress Hosting is to offer a completely hassle-free experience so that you can concentrate on managing your business and doing what you are good at. One of the best aspects of Managed WordPress Hosting is the premium support. This is provided by real WordPress experts with a lot of experience instead of someone reading a manual or supporting multiple CMS platforms. So, what is Managed WordPress Hosting as it should be? Check it out at Kinsta. There are of course, many more providers of Managed WordPress Hosting in the world. So why would you choose Kinsta? 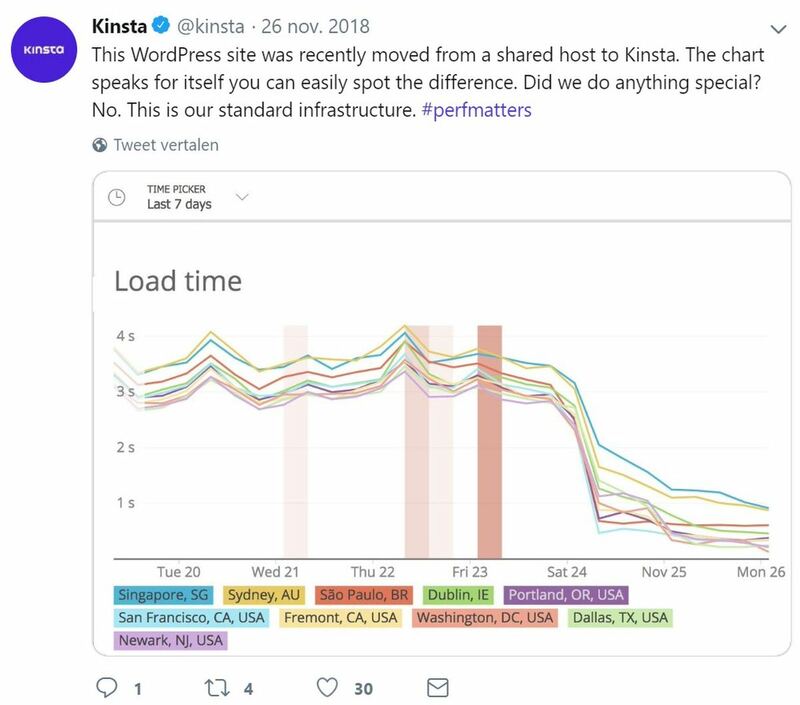 In this example the differences between Kinsta and WP Engine, the largest Managed WordPress Hosting Company in the world. More stable and fewer errors. Free migrations (Pro package and onwards). Excellent support, also for complex issues. Many Google Cloud locations, also in the UK (London). My Kinsta Dashboard: easier and more versatile. Below, and in this article, are the differences between Kinsta and Siteground, another popular WordPress Host. 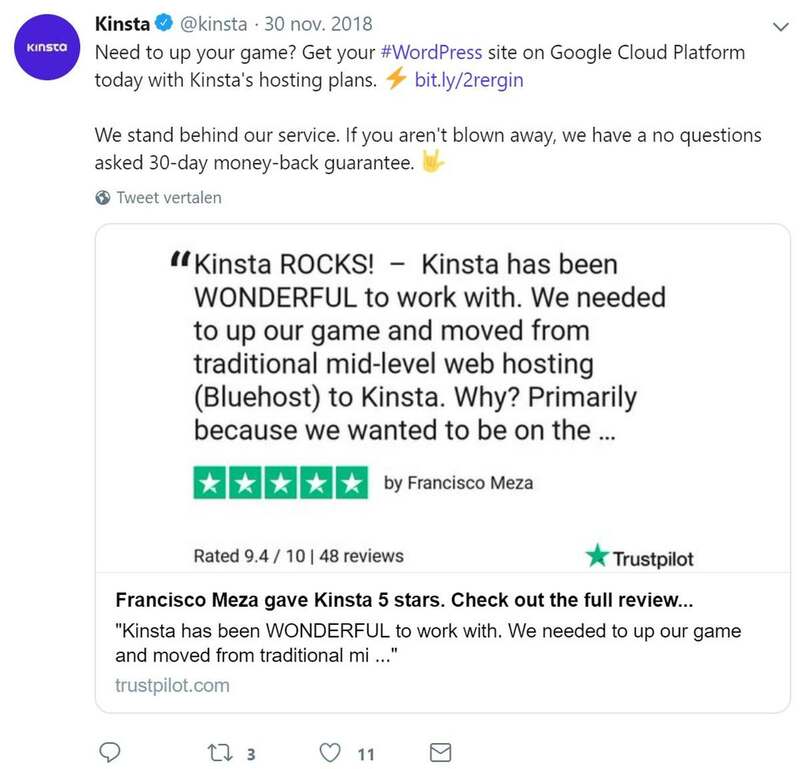 So why choose Kinsta instead of SiteGround? Kinsta has dedicated hosting, therefore, a much faster WordPress website. Server-level caching is standard on all plans, which is much faster. More stable, and fewer errors. 24/7 support, also for complex issues. Countless Google Cloud Platform locations. Are there no disadvantages to be found then? 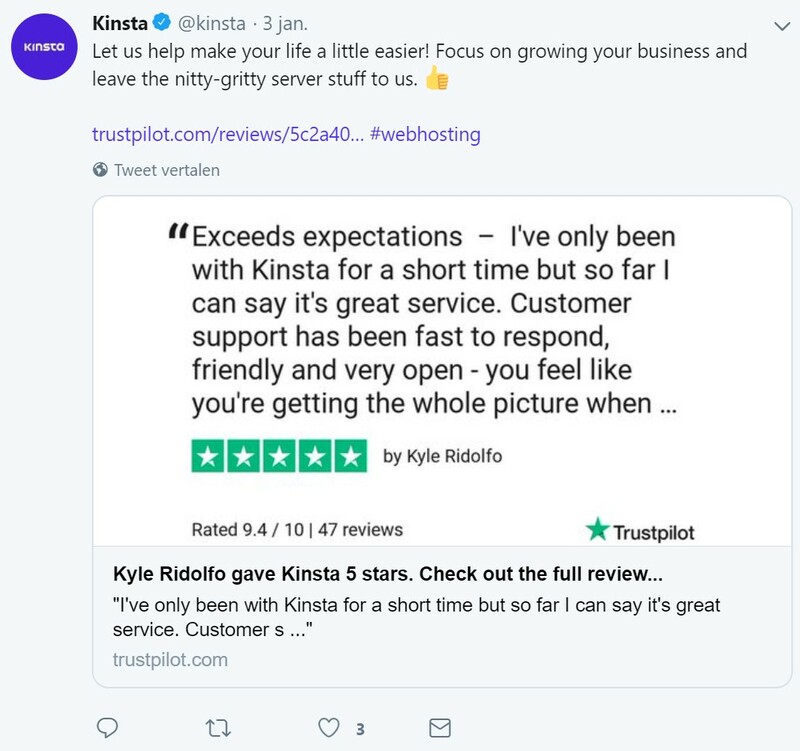 Because Kinsta focuses entirely on hosting, and nothing else, they do not do email. That’s no problem in itself, because you have in no time and for very little cash email functionality via Google Suite (also i.c.m. Outlook). We use Outlook ourselves, so that’s no problem at all. And it can easily be arranged on any domain. These are the “drawbacks”. Furthermore, I really cannot think of anything else. Some things work differently than via cPanel, but in practice, it’s better and more convenient in 99% of the cases. You just use the Kinsta control panel and / or their outstanding support. It will sound like I am completely in love with Kinsta (and that’s true …). But of course you should never trust just one opinion! Therefore, check this feedback for Kinsta on Twitter below or on G2Crowd or Reviewplan. Simply put: I would have liked to have heard about Kinsta much earlier. As mentioned, the main reason for switching was to improve the speed of our website. But what we got was so much more functionality and ease of use, that we were actually disappointed not to have known about Kinsta before. It would have saved us a lot of time and frustration. 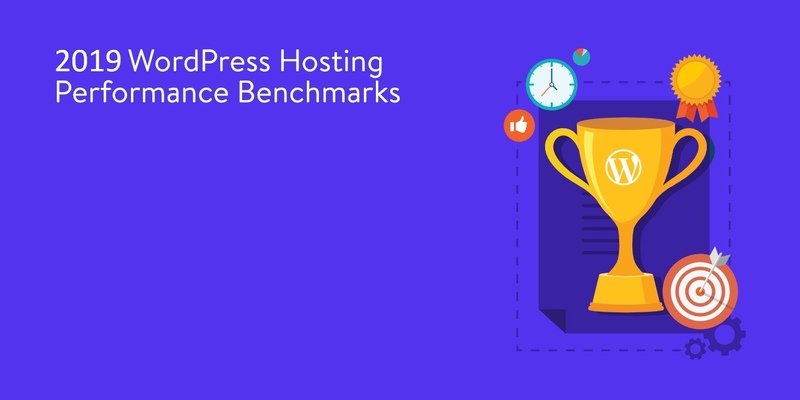 So, I dare to state, without exaggerating, and fortunately many tests and benchmarks agree with me, that Kinsta has the Best Managed WordPress Hosting in the UK. To underline that, below is our review of this extraordinary WordPress Host. So: migrate to Kinsta as well. It would be, by far, your best decision in 2019. Do you have questions about this article, about Kinsta in general or about my experiences with them? You can always email me at olafvangessel@gmail.com. Good luck with finding your best WordPress hosting in the UK! Olaf is founder and owner of a large number of websites (including Sneakerscanner.co.uk). He has decades of experience building and hosting websites, both in-house and for companies.